This year I did not get to do as much reading as I would like because of school demands, and much of it what I did read was playing catch-up on 2017 books after the YMA awards. So instead of three separate lists for picture books, middle grade, and teen reads like I did last year, I'm just doing one list with a few favorites of each category, mostly books published in 2018, but I might include a few from 2017 that I didn't read until 2018. Surprisingly, this is my weakest category this year. I just did not come across very many new picture books that really caught my attention, and the ones that did tended to be more non-fiction. I just don't think this was a very good year for good storytime books (at least the ones that fit my style); everyone seemed to be much more focused on jumping on the social issues bandwagon than writing books kids would really enjoy, plus I'm not doing as many storytimes now, so I don't get the chance to try them out like I used to. My absolutely favorite storytime book of those I discovered this year (thanks to jbrary!) was actually published in 2017, but it's so good I have to include it. 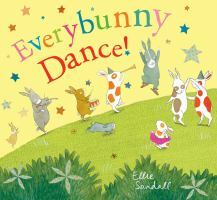 This is a highly interactive book that I have the kids stand up and act out. They clap, twirl, dance, sing, pretend to play musical instruments, run, and hide with the bunnies, and at the end they can even do the bunny hop. 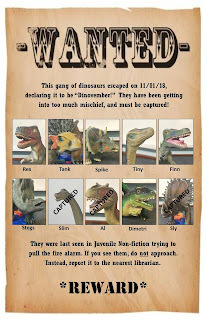 A must-have for any storytime collection! Shark Nate-O by Tara Luebbe & Becky Cattie, illustrated by Daniel Duncan. 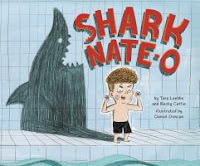 I'm always on the lookout for new shark books, so this caught my eye immediately, though it's really about a boy who can't swim and is apprehensive about trying. What I really loved were humorous little references to the notorious Sharknado and classic Jaws movies for the adults. A good lesson in overcoming fears and perseverance, plus some shark facts. 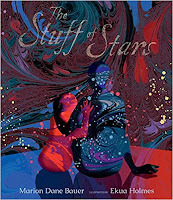 The Stuff of Stars by Marion Dane Bauer, illustrated by Ekua Holmes. While a cataloging conundrum (picture books, 811's, or 523's?? ), this book is a lyrical poem describing the big bang, likening it to the birth of a child, accompanied by Ekua Holmes absolutely AMAZING illustrations. I cannot tell you how much I love this book! Probably not a good choice for storytime, but excellent for a one on one lap read. 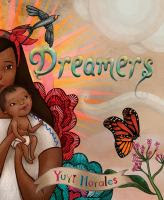 This beautiful story is inspired by Yuyi's real-life experiences as an immigrant and mother of a young child, and her discovery of the public library and how much it helped her and her son. I don't usually get emotional reading picture books, but this one got me a little teary-eyed and gave me chills when she talked about finding this wonderful place where everyone was welcome, and turning the page to see it was the library. I thought this was going to be a political statement about immigration policy, but instead it was a wonderful tribute to public libraries and librarians. 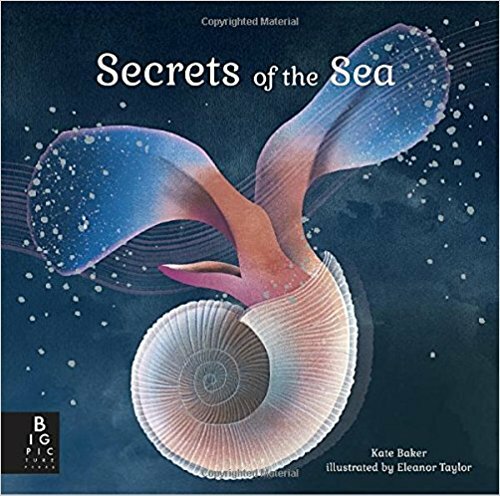 This is a true non-fiction picture book, exploring the different regions of the ocean and focusing on very small creatures, or small details of larger creatures. The text is full of factual information, and the illustrations are absolutely beautiful and detailed. A very gorgeous "coffee table" type book for kids or adults. 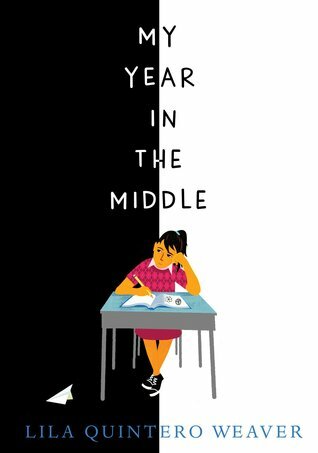 I did read several great middle-grade novels published this year, plus some from last year, too. The parents of avid reader June object to a book she got from the school library, and they go to the school to complain. This one complaint grows into mass hysteria and extreme censorship, both at June's home and school. She finds a Free Little Library and begins to supply other students with banned books. 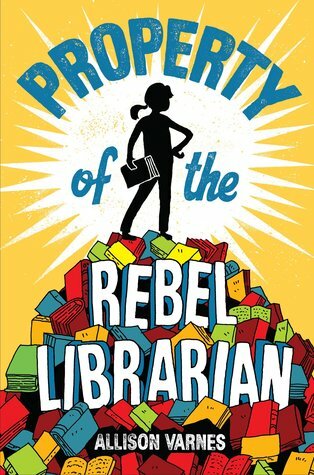 Some have complained about how unrealistic and exaggerated the censorship was, but I didn't mind the hyperbole to make a point and loved the book as a tribute to children's librarians everywhere. 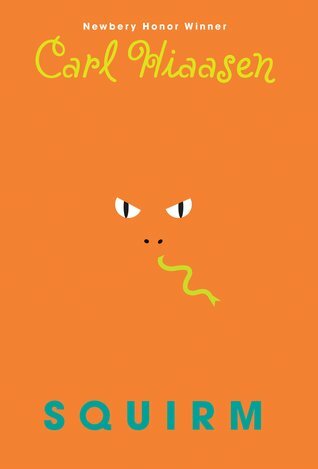 I love Carl Hiaasen's books, and this one did not disappoint. Just like all the others, this one has humor, adventure, and a message about conserving nature. The one difference about this one is that at least half of the action takes place outside of Florida. This is a great, fun read, perfect for someone who wants something that is not fantasy or sci-fi, is a little lighter but still has plenty of adventure and no romance, and likes to see jerks and bullies get what they deserve. Lowen and his family need a fresh start in a new place after one of Lowen's friends is killed in a convenience store robbery. 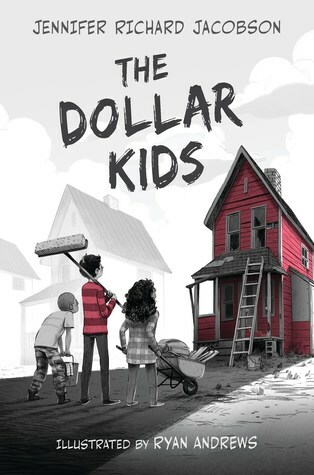 They decide to buy a foreclosed house in a dying town for $1, but while some of the town welcomes them with open arms as expected, others treat them with suspicion and resentment. There is a lot going on in this book, but it is all pulled together together fairly well. It's about dealing with guilt, overcoming obstacles, and working together for the common good. Highly recommend. This is a great story of a young Argentinian-American girl in racially-polarized 1970 Alabama, who feels she doesn't really quite fit in on either side, and cautiously navigates the no-man's land in the middle, while also dealing with bullying resulting from jealousy over her new-found running talent and changing friendships. A story about friendships, racism, and pursuing one's talent and passion. In this semi-autobiographical story set in 1983, 13-year old Vanessa is thrilled when Vanessa Williams is named Miss America, paving the way for future African-American beauty queens. Vanessa dreams of one day being Miss America, and soon finds herself in a school pageant. This is a great story about learning to be comfortable in your own skin and re-defining "beauty". I loved this book, and it reminds me very much of Rita Williams-Garcia's work, but for whatever reason it doesn't seem to have gotten much attention. However, I highly recommend it, so give it a try! And finally I'm just going to quickly mention this year's Pura Bel Pre honor book, The First Rule of Punk by Celia Perez. This is another great book that has been overlooked by many. It deals with with some of the unique issues biracial/multicultural children deal with in figuring out who they are and how they want to express their cultural identities, but also has several issues all kids can relate to: starting over, fitting in, mean girls, forming new friendships, and school dress codes. 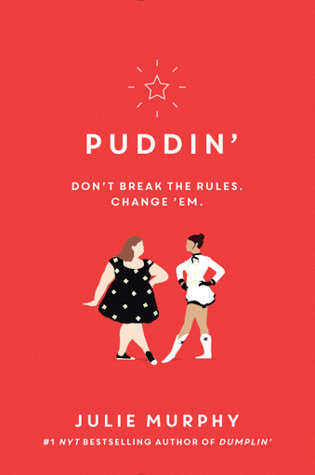 Sequel to the hit Dumplin', I think this one is even better! This book picks up where the last one left off, but focuses on Millie and Callie, two girls who seem to have absolutely nothing in common, but when circumstances force them to work together, the begin to find common ground and form an unexpected friendship. I like that not only do we see Millie fight for her goals, but we get to see another side of Callie and understand what is behind her "mean-girl" bravada. 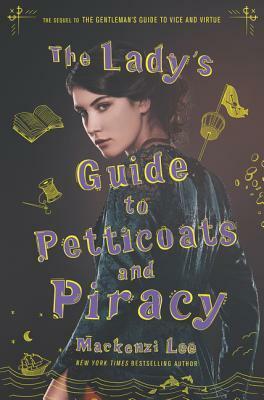 This sequel to The Gentleman's Guide to Vice and Virtue continues where the last one left off, but now following Felicity, though Percy and Monty do make an appearance. This story is full of strong, independent women, with a clear "girl power" message. Overall I really enjoyed it, though I wish Percy and Monty had had slightly larger roles, but just like the first, I really could have done without the odd, forced bit of fantasy added to the story. I felt it added nothing, and only detracted from the story. I did not read a lot of YA published this year that I really liked, so I'm going to include a couple from 2017 that were really exceptional. This was such a well-done, powerful story told in verse (so it's a quick read). Will is planning to avenge his brother's recent death due to gang violence, and is convinced he knows who did it. But as he rides the elevator down, at each floor someone from his past gets on, and they all have something else in common. Besides knowing Will, they were all victims and/or perpetrators of gun violence. Will he change his mind? A great story, well deserving of its many awards and honors. This is a wonderful book that is at times painful to read due to the emotional abuse Kiko's mother inflicts on her because of being half Japanese. It is heartbreaking and maddening to see what Kiko puts up with before she FINALLY finds her spine and her voice. Highly recommended, Kiko's mother is a very unsympathetic character one will love to hate! Well, that's the best I can come up with. 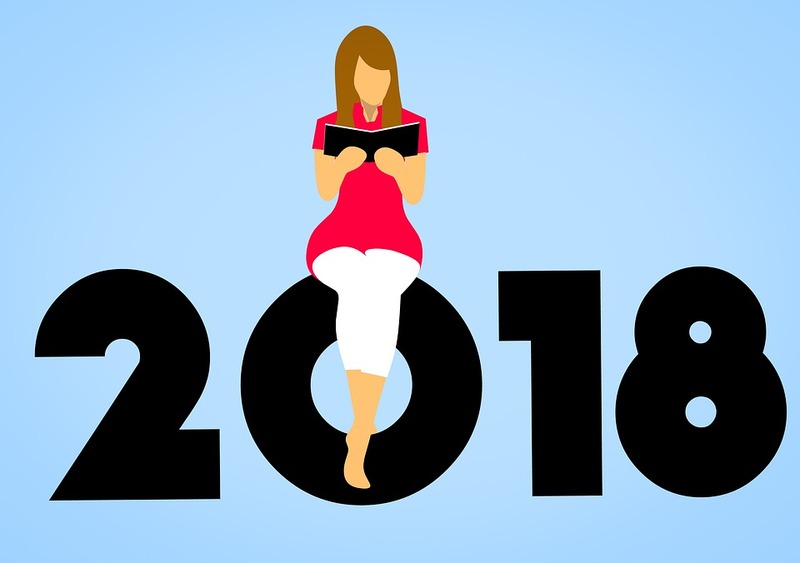 If you want to see the other middle-grade and YA books I read, check out my Goodreads 'Year In Books'. 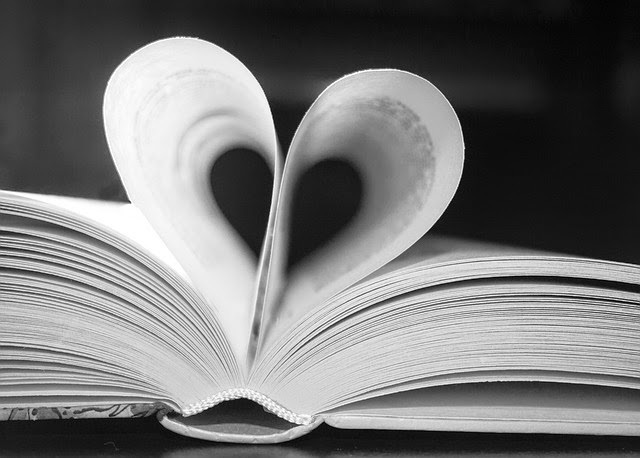 I know I missed out on a lot this year, so please, tell me about your favorites in the comments, especially any good storytime books I've missed! For some of these I used clipart for patterns, and for others I used the "shapes" function in Publisher or free-handed. I added subtle shading and details to the chocolate chip cookie and waffle lines to the sugar wafer (rectangle) cookie with Sharpies. 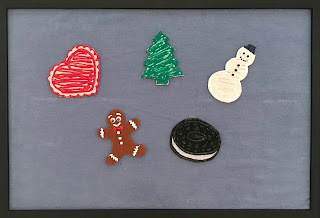 All the "icing", creme filling, and chocolate chips were added with puffy paint. Green glitter glue was used to imitate colored sugar on the green square, and blue glitter was sprinkled on the triangle while the paint was still wet. Five little cookies, with frosting galore! Daddy ate the red one, and then there were four. Four little cookies, two plus two you see. Mommy at the green one, and then there were three. Brother ate the white one, and then there were two. Two little cookies; oh, what fun! Sister ate the brown one, and then there was one. *I* ate the last one, and then there were none. Depending on how large your crowd is and how many times you want to repeat, you could also use the names of the children attending, instead of the generic nicknames here. Instead of color, you could also go by shape or type of cookie. I always like to repeat 5-little something fingerplays, and have them use the non-dominant hand the second time so that they are working on the dexterity of both hands. He/She bought one cookie and took it away. No little cookies shining with sugar on top. Along came (_____) with a dollar to pay. He/She saw no cookies, and sadly walked away. And finally, I found this Christmas one at Felt Board Magic, though just a few days late for this year. Along came a reindeer & guess what he ate? One of the cookies sitting on the plate! because that’s what Santa’s reindeer ate! I realize these are all counting down rhymes, and I normally like to include both, so if you know a cookie song or rhyme that counts up, please let me know in the comments! 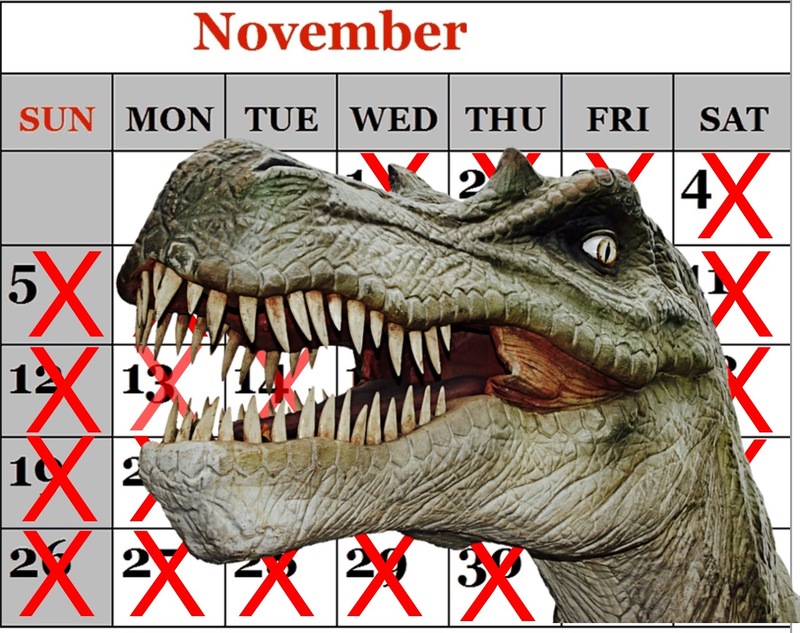 After my big, messy Paleontology program last month, I needed to do something a little simpler, with little to no preparation or clean-up required this month! So I decided it was time for this deceptively simple, yet challenging engineering activity that I saw on a homeschooling mom's blog,"Frugal Fun for Boys & Girls" a couple of years ago and have been waiting for the opportunity to try. 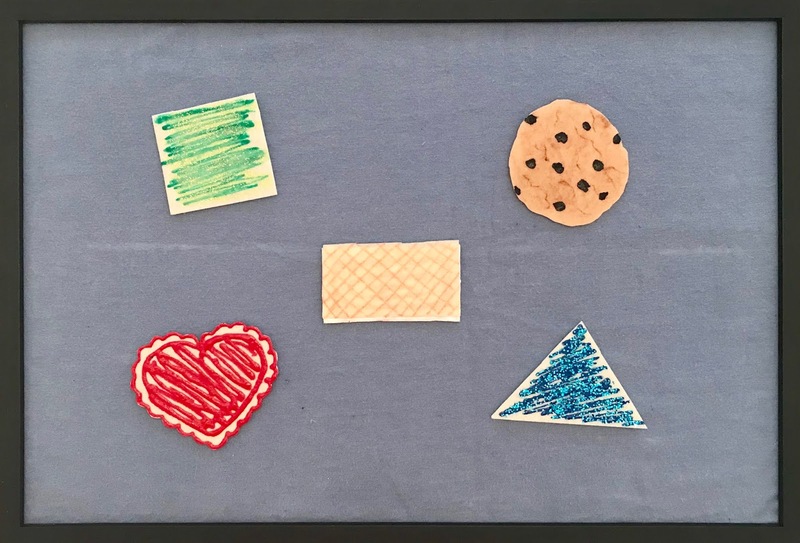 This activity uses everyday items (craft sticks, clothespins, and binder clamps) as unconventional building materials, requiring the kids to experiment, problem-solve, and think outside the box more so than traditional building materials like Legos, Magna-tiles, etc. The original blogger did several challenges, but she just had 3 kids and presumably more than an hour, so I limited it to two: building a bridge or platform that could hold at least one book, and building the tallest structure possible. Divided craft sticks into bundles of 25 with rubber bands. Divided clamps into sets of 10 (recommend 15) in disposable sample cups. Divided clothespins into sets of 10 (recommend 20); they were attached to cardboard, so I just left them that way. 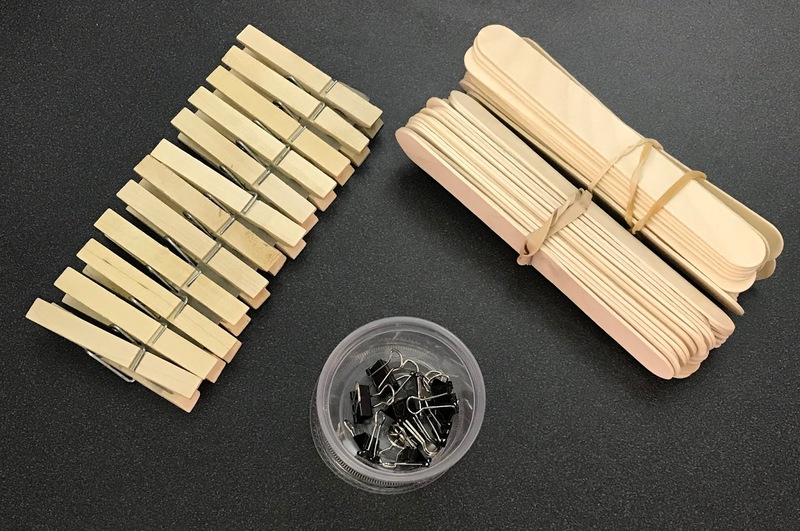 Each participant was given 2 bundles of craft sticks, a set of clothespins, and a set of binder clamps, and shown a few pictures to give them ideas of how the materials could be put together to help them get started. They were instructed to used these materials in any way they they wished to construct a bridge or platform that was large enough and strong enough to hold at least one book in 15 minutes. [I had several sizes, but stuck with 3 small hardbound intermediate chapter books]. Fifteen minutes was not enough time for most, so gave an additional 5 minutes. Began testing as they finished, by placing one book at a time, and going up to 3. For this challenge, I had them combine into teams of 2, and pool materials. 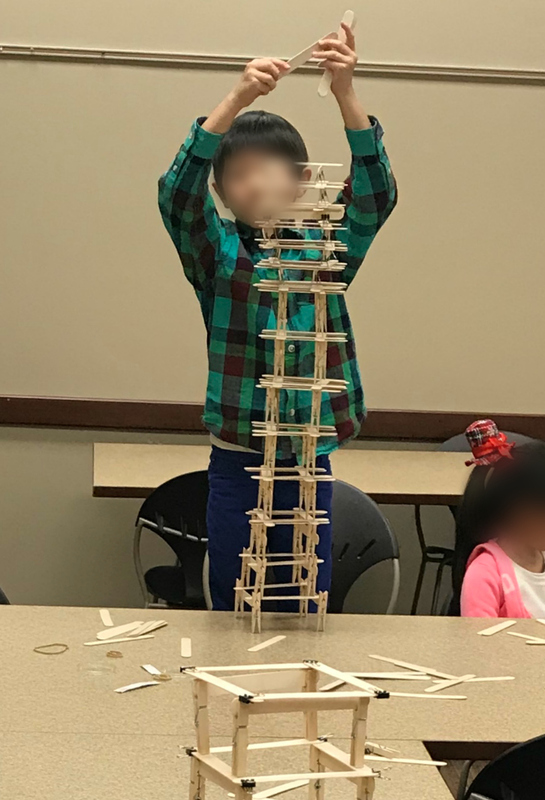 I instructed them to work together, making sure both people were getting to contribute ideas and build, and see how tall a structure they could build. I also instructed the adults to please step back and let the kids figure it out and only provide minimal assistance. I initially gave 20 minutes, but just let them go until the end of the program as some were struggling. 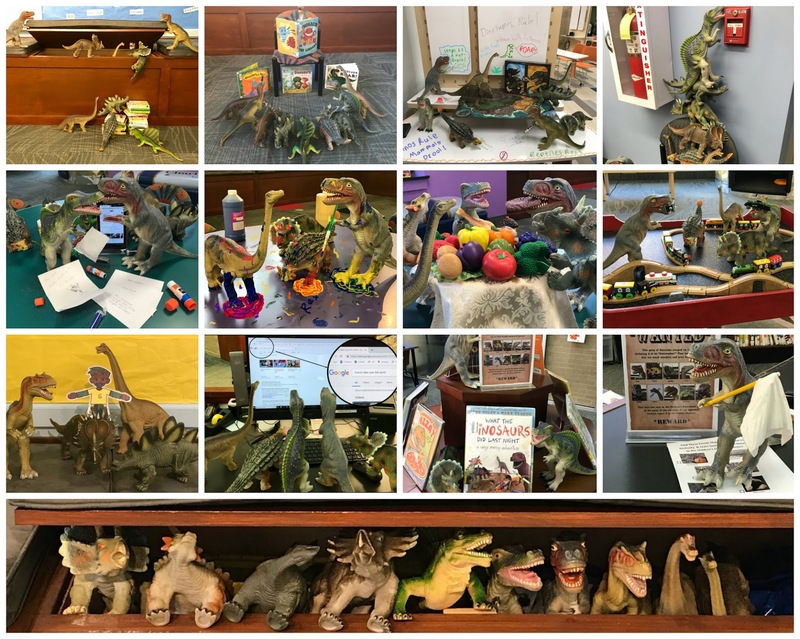 Everyone was able to build a structure that supported at least one book, and a few could support 2 books, and two could support 3 or more (we only tested with 3), with significant parental assistance for most. However, only 3 of the 5 groups were able to build a structure with any significant height. 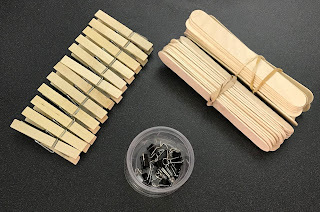 I did find that I had more craft sticks than needed, but not quite enough clothespins or binder clips (I have included both actual and recommended amounts of each in the "Materials" section). This proved to be far more challenging for this group of kids than I expected. I really didn't think it was that hard, but most of them were completely daunted by having materials that didn't have an obvious, straightforward way of building. Most of them heavily relied on adult assistance, not just in building, but in design as well. Some also got very easily frustrated, and one even cried. Trying to get them to work in teams did not go well at all. I had really hoped that by working together they would have more success, but I noticed in every single pair either one person did everything while the other just watched, or they each did their own thing instead of working together on one structure. I also noticed that trying to get the adults to step back and let the kids take the lead did not work, either. In retrospect, I should have started of with just having them free-build, and leading them in building different modules so that they could get the hang of ways to combine the materials before doing the challenges. Also, with the younger crowd I'm getting it is probably not realistic to expect the kids to be able to work together effectively, and I should just approach it as an opportunity for kids and their caregivers to work together, and focus on modeling how the adults can assist without just doing it for the kids, and how to encourage the kids to problem-solve. There was one participant that really excelled once he got the hang of it from looking at the examples. He ended up building a tower that was about 3 feet tall before it collapsed. I was really surprised the other kids didn't observe what was working for others and try to learn from that. I still like this activity, but I would not recommend it for the younger ages I tend to get. Though the program is supposed to be for ages 5-10, and I was hoping to get more 8-10 year olds, the reality is that is that I mostly get ages 5-8, and I'm still struggling to get things simple enough for them sometimes. This activity would probably be best for the tween age group, 10-13. But, even though some found it too challenging, most did not seem to get overly frustrated, and one of the ones that struggled the most still said he wanted to come back for next month's program. My current library serves a very diverse population, so we do not do holiday themes at all for regular weekly storytimes (though we do some separate holiday special programs), but I still wanted to do something seasonal, or holiday-adjacent. I like to wait and do snow-related themes in January/February and I'm tired of doing hibernation, so I decided on "Cookies", since everybody likes cookies and they are often a part of holiday and other celebrations. "C" is for cookie, that's good enough for me. Oh, cookie, cookie, cookie starts with "C"! Then we sang our story song, adding a "say yum-yum!" 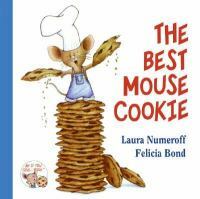 verse, and read our first story, The Best Mouse Cookie by Laura Numeroff and Felicia Bond. The kids recognized the mouse right away from If You Give a Mouse a Cookie. I like this book because (1) it's a little shorter and works well for less attentive audiences, (2) they likely haven't heard it before, and (3) it shows Mouse baking cookies, which gives lots of opportunities for interaction with questions and motions, as well as deductive reasoning by observing smoke coming out of Mouse's house and predicting that he burned the cookies. It also shows that sometimes things get messed up and you have to start over but that's okay and sharing with friends. After that we did an action rhyme and pretended to make cookies. At the end, I asked if anyone burned their cookies; then we compared what kind of cookies we each made, were they chocolate chip, sugar cookies, gingerbread men, oatmeal, peanut butter, etc. 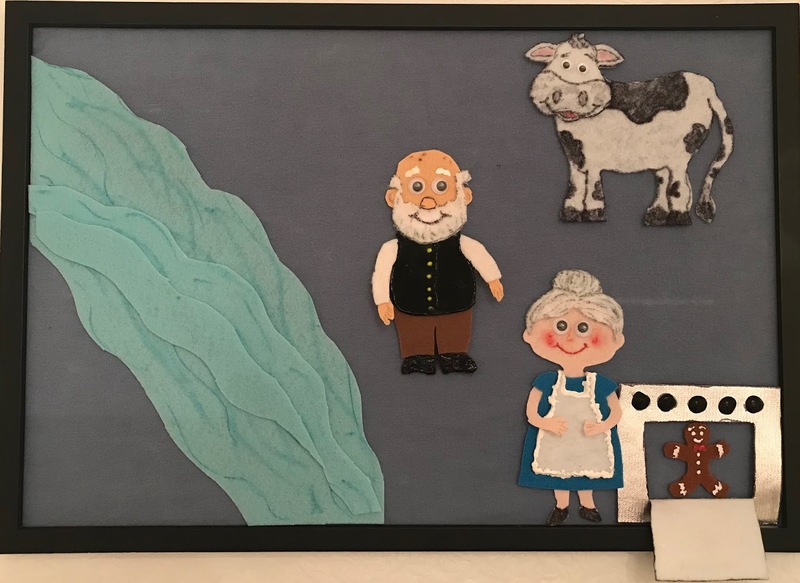 Our next story was The Gingerbread Man, but I chose to tell it with a flannel board instead of reading a book, because I've never been able to find a version I liked for the younger kids. Most are too long and text-heavy, and while Harriet Ziefert's version is short and simple enough, the book is too small and illustrations dull. All the pieces are pictured below; for more details on how I made it, see my previous Flannel Friday post. 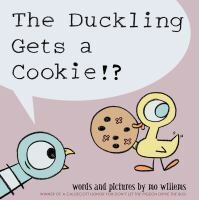 After that we read our final story, The Duckling Gets a Cookie by Mo Willems. Of course everyone recognized the Pigeon, and we discussed how sometimes Pigeon is naughty and how sometimes he can be really impatient and forget his manners. In this story, Pigeon is upset because the Duckling gets a cookie just by asking (politely), but he never gets what he asks for. In the end he gets a pleasant surprise. This book is a fun lesson in asking politely, saying thank you, and sharing. I followed that with a cookie countdown rhyme I found at "Everything Preschool" and modified slightly, accompanied by pieces from another felt set I made that will be featured in my next "Flannel Friday" feature. 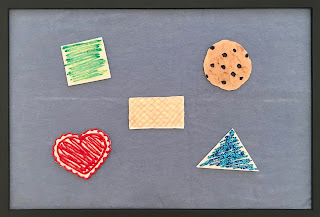 We also discussed the shapes found in the cookies, and you could just make them simple geometric shapes as well. I made two different ones for brown, since I couldn't decide which I was going to use. (I like options). We ended with a closing song, and then moved to the optional craft that was extra-special today. Our craft was decorating gingerbread man cookies! I kept it very simple, partly due to the younger ages I usually get, and partly because we have to do it in a carpeted space and I didn't want our custodian to hate me. 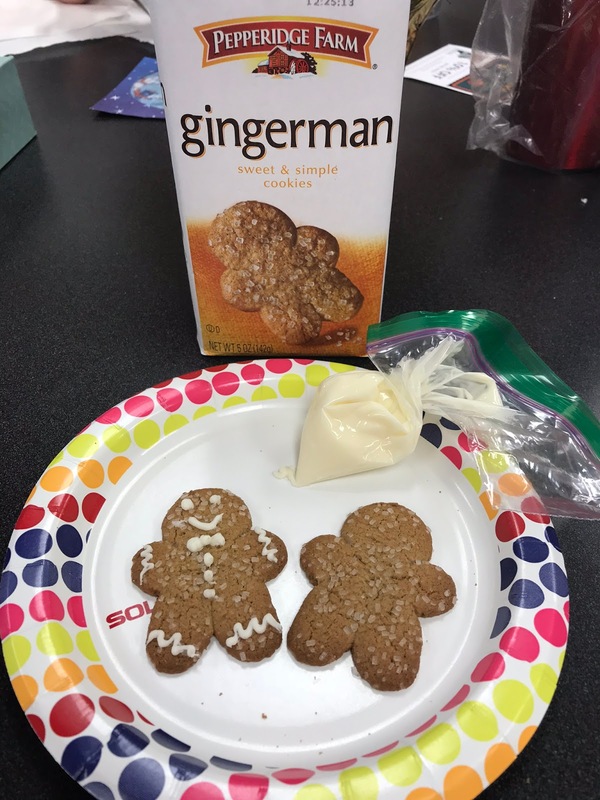 I used Pepperidge Farm Gingermen cookies because that is literally all we could find. They worked fine, I just would have rather had some slightly bigger and without the sugar on top. They are a good choice for the younger kids because the flavor is a little milder and they are crisp, but not hard. 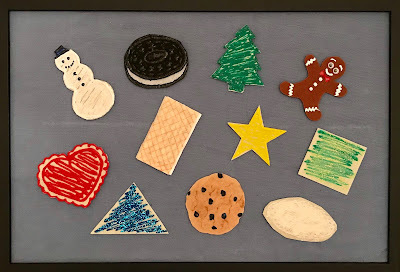 I gave each child two cookies on a paper plate and about 2 tablespoons of vanilla icing (from a can) in a snack-sized zip-lock bag with just the very tip of the corner snipped off. I also had additional bags of green and red icing if they wanted to add colored accents. Then I demonstrated how to squeeze the icing out to decorate the cookie, and told them to decorate theirs however they liked. The kids all really seemed to enjoy it, and were proud of their finished cookies, but of course eating them was the best part! I did tell them they could eat them when they were done IF their grown-up said it was okay, but to listen to their gown-up if they wanted them to save for after lunch (our storytime is at 11:00, and it's usually close to noon by the time they finish the craft/activity). This was a really fun storytime, and it had the holiday feel for those who wanted it, but was still neutral and included everyone. 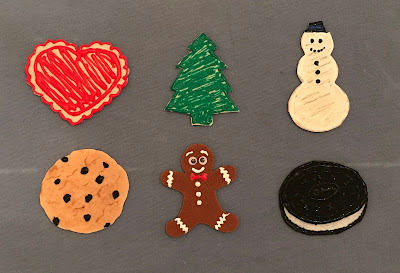 The theme also really got the kids attention and I had much more enthusiastic participation all around than I sometimes get; even the shy kids would say what kind of cookie they liked. I think having stories that had characters they were familiar with, but hadn't necessarily heard the story before helped get them engaged, too. 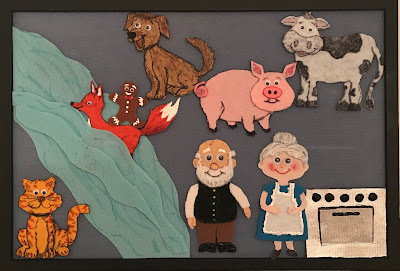 I've made felt sets before, but this was the first time I'd used one to tell a story as opposed to using with a rhyme or song, and I really need to start doing that more. 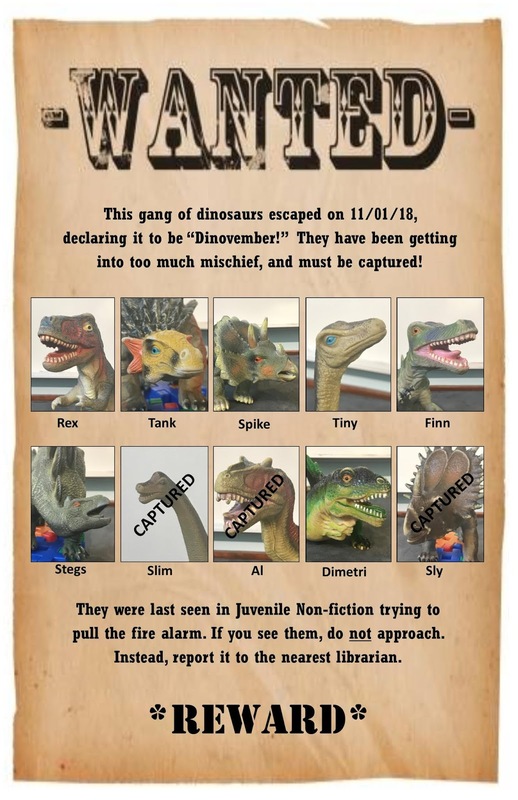 It's a great way to adapt a story to a younger age group and shorter time frame/attention span. This was one of my more detailed sets and I was really pleased with how it turned out, and the kids seemed to like it, too. Of course the special craft was a huge hit. It was interesting to see the dynamics. Some parents just let the kids figure it out for themselves, some had to help them make at least one cookie look "right" but then let the child do the second one. Some kids did put some intentional design into their cookies, and others just squeezed icing on randomly. Piping icing is actually good pre-writing practice as it works on muscle strength and coordination in the hands and fingers, and fine motor skills. The biggest surprise was how little mess there was afterward! I just had to pick two pieces of cookie of the floor, and wipe down the tables, which just had a few crumbs and smudges! I have tried to find a version of the folktale The Gingerbread Man to use in storytime a few times, for a "Folktales & Nursery Rhymes" theme, a "Cookie" theme, and at holiday time, but have never found one I really liked. There are many variations and a number of cute versions, but they are always way too long and text-heavy for my kiddos. The closest I've found is Harriet Ziefert's, but the book is so small and illustrations a little dull. So I decided to make it into a flannel story in order to tell an abbreviated version, and tell it the way I wanted to. This is actually my first true story set! All the ones I have made before were to go along with various songs and rhymes. I am still fumbling around with different techniques, learning by trial and error, so mine aren't necessarily put together in the best or prettiest way (don't look at the backs :D), but in the end I was pretty happy with them, other than now wishing I'd made the animals slightly smaller. 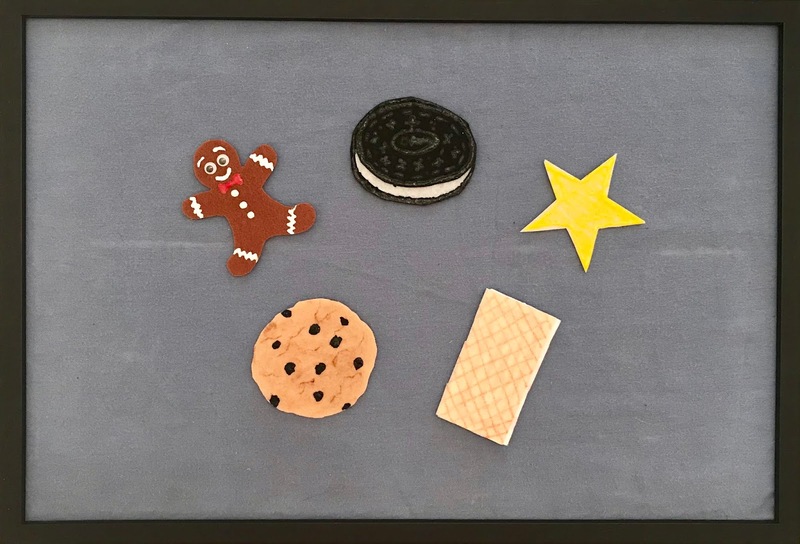 I found clip art online to use as patterns and for the first time I had stiffened felt to work with, which made a world of difference, especially since my scissors at home were not the greatest. I have no time to make flannel sets at work now, so I've bought my own felt supply and make them at home. The bonus is that they now belong solely to me and I won't have to leave them behind if I change jobs (like I did my "Five Nervous Turkeys" that took FOREVER to make 😭). I cut out the pieces and glued them together with Aileen's Tacky Glue, added details with colored sharpies, and some puffy paint. Note: Puffy paint takes a long time to dry! I've never used it before and I was not expecting that. I used googly-eyes, because the kids like them, I like them, and they just make everything more fun! The old man and woman took a fair amount of time, but the rest went fairly quickly. I made a couple of different sizes of the gingerbread man, too. (I must confess I ate a fair number of Pepperidge Farm Gingermen while I was working on these 😉). Run, run, as fast as you can! You can't catch him; he's the Gingerbread Man!